It features a crisp and smooth roasted malt finish without any lingering bitterness, leaving you yearning for that next sip. Great tasting with a clean, smooth finish. 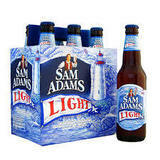 Sam Adams Light is not just a lighter version of our Samuel Adams Boston Lager but rather the culmination of over two years of tireless research and brewing trials that proved to be worth the wait.